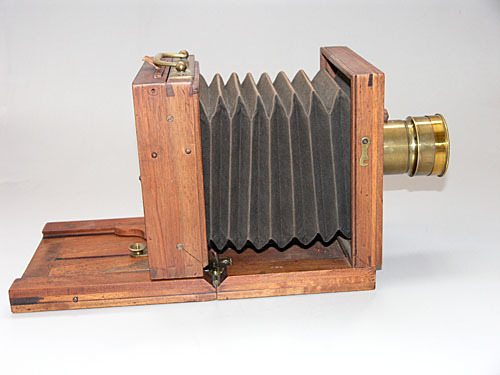 FRENCH OR ITALIAN EARLY TAILBOARD CAMERA. 1850s. 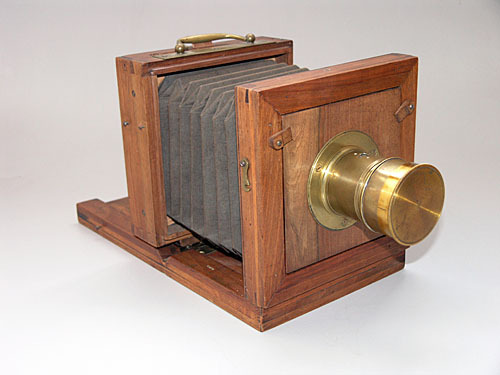 The camera itself is unlabelled, often the case at the period of 1850-1860, but the original lens carries the name 'A. Bernoud, Naples et Florence'. Alphonse Bernoud was not a camera-maker or lens-maker, but an esteemed and well-documented society photographer with studios in Naples, Florence and Livorno, as well as in various parts of France. This could have been one of his cameras, as it was not unusual in the 1850s for professionals to have their personal lenses engraved with their own names. 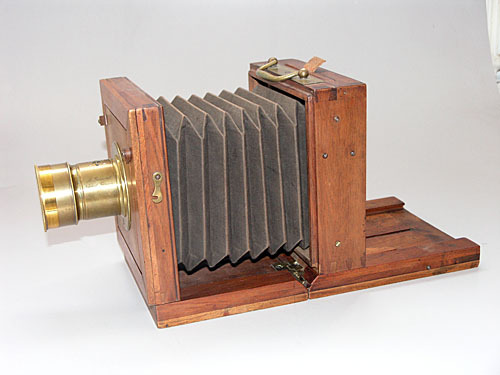 The camera is made of Walnut, in the French style, but may be of Italian origin. If this was Bernoud's camera, it is about as unique as they get.